ED: Noor: We all knew there were no WMD's in Saddam's hands whatever his intentions might have been at the time. 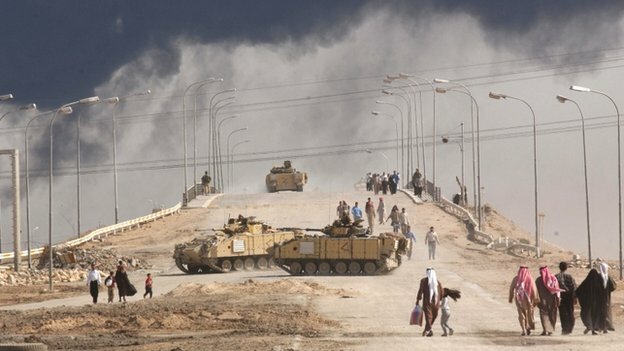 This BBC documentary brings you proof and introduces us to the primary two spies responsible for the fabricated information that helped lead to this disastrous assault on the Iraqi people. Of course, Usrael would have found an excuse if this had failed; you can be sure they had many irons forging in the Iraqi fire. In the film, what angered me most was, when (at 2:18 min in) asked if he lied, the one perpetrator actually seemed to be smirking! Perhaps it was shame... but these men do not have a conscience to do what they do. The lies of two Iraqi spies were central to the claim ~ at the heart of the UK and US decision to go to war in Iraq ~ that Saddam Hussein had weapons of mass destruction. But even before the fighting started, intelligence from highly-placed sources was available suggesting he did not, Panorama has learned. "The programme is not shut down," he said. "It is up and running now." Mr. Blair used the intelligence on WMD to justify the war. Designed for public consumption, it had a personal foreword by Mr. Blair, who assured readers Saddam Hussein had continued to produce WMD "beyond doubt". Why is this man still alive? Why is he not up on international charges? "What appeared to be gold in terms of intelligence turned out to be fool's gold, because it looked like gold, but it wasn't". 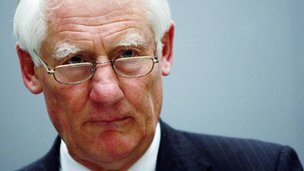 Lord Butler, who after the war, conducted the first government inquiry into WMD intelligence, says Mr. Blair and the intelligence community "misled themselves". Lord Butler and Sir Mike agree Mr. Blair did not lie, because they say he genuinely believed Saddam Hussein had WMD. 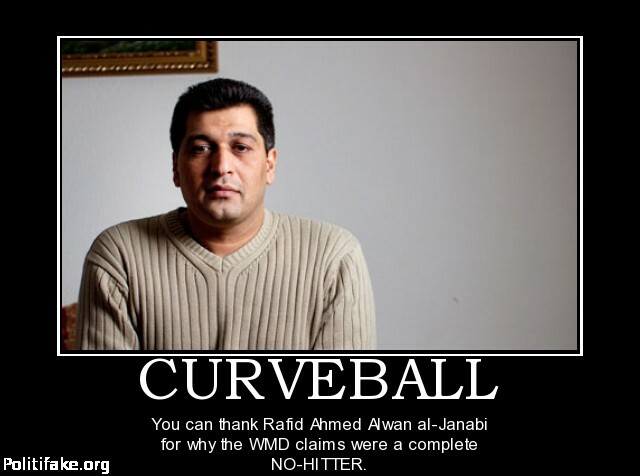 Mr. Janabi arrived as an Iraqi asylum seeker at a German refugee centre in 1999 and said he was a chemical engineer, thus attracting the attention of the German intelligence service, the BND. The Germans had doubts about Mr. Janabi which they shared with the Americans and the British: MI6 had doubts too, which they expressed in a secret cable to the CIA~"
Elements of [his] behaviour strike us as typical of individuals we would normally assess as fabricators [but we are] inclined to believe that a significant part of [Curveball's] reporting is true." He was an Iraqi former intelligence officer, called Maj Muhammad Harith, who said it had been his idea to develop mobile biological laboratories and claimed he had ordered seven Renault trucks to put them on. He made his way to Jordan and then talked to the Americans. Muhammad Harith apparently made up his story because he wanted a new home. His intelligence was dismissed as fabrication 10 months before the war. MI6 also thought they had further corroboration of Curveball's story, when a trusted source ~codenamed Red River ~ revealed he had been in touch with a secondary source who said he had seen fermenters on trucks. But he never claimed the fermenters had anything to do with biological agents. After the war, MI6 decided that Red River was unreliable as a source. But not all the intelligence was wrong. Information from two highly-placed sources close to Saddam Hussein was correct. Both said Iraq did not have any active WMD. The CIA's source was Iraq's foreign minister, Naji Sabri. Former CIA man Bill Murray ~ then head of the agency's station in Paris ~ dealt with him via an intermediary, an Arab journalist, to whom he gave $200,000 (£132,000) in cash as a down payment. He said Naji Sabri "looked like a person of real interest ~ someone who we really should be talking to". Murray put together a list of questions to put to the minister, with WMD at the top. The intermediary met Naji Sabri in New York in September 2002 when he was about to address the UN ~ six months before the start of the war and just a week before the British dossier was published. The intermediary bought the minister a handmade suit which the minister wore at the UN, a sign Mr. Murray took to mean that Naji Sabri was on board. "had some chemical weapons left over from the early 90s, [and] had taken the stocks and given them to various tribes that were loyal to him. [He] had intentions to have weapons of mass destruction ~ chemical, biological and nuclear ~ but at that point in time he virtually had nothing". "Iraq was currently producing and stockpiling chemical weapons" and "as a last resort had mobile launchers armed with chemical weapons". Mr. Murray disputes this account. 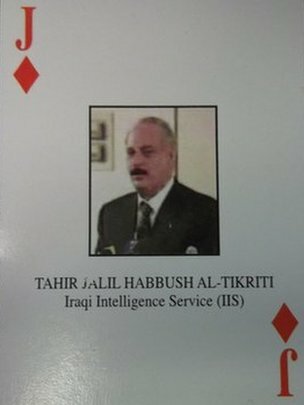 The second highly-placed source was Iraq's head of intelligence, Tahir Jalil Habbush Al-Tikriti ~ the jack of diamonds in America's "most wanted" deck of cards which rated members of Saddam Hussein's government. A senior MI6 officer met him in Jordan in January 2003 ~ two months before the war. It was thought Habbush wanted to negotiate a deal that would stop the imminent invasion. He also said Saddam Hussein had no active WMD. 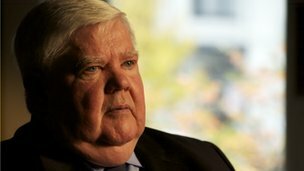 Surprisingly, Lord Butler ~ who says Britons have "every right" to feel misled by their prime minister ~ only became aware of the information from Habbush after his report was published. "I can't explain that," says Lord Butler. "This was something which I think our review did miss. But when we asked about it, we were told that it wasn't a very significant fact, because SIS [MI6] discounted it as something designed by Saddam to mislead." Lord Butler says he also knew nothing about the intelligence from Naji Sabri. Ex-CIA man Bill Murray was not happy with the way the intelligence from these two highly-placed sources had been used. "I thought we'd produced probably the best intelligence that anybody produced in the pre-war period, all of which came out ~ in the long run ~ to be accurate. The information was discarded and not used." I read on a Jewish site by the Mosaich that the Iraq and Gulf war were miracles God made for them. They did not have to lift a finger in fighting and none of their troops were sacrificed which was another miracle. Their feeling is the Jewish life is superior to any other life killed which proves how wicked they truly are.